Viral infections are usually detrimental to the hosts, causing many diseases and sometimes resulting in death. Because of this, humans and other higher animals have developed many forms of immunity against them. the complement system: a complex group of more than 30 soluble proteins and receptors that mediate humoural immunity. the cellular system: mainly include natural killer (NK) cells, and when activated by IL-2 and IFN-gamma, becomes lymphokine-activated killers (LAK). the cell intrinsic system: a highly complex system of pathogen recognition receptors (PRRs) and pathogen-associated molecular patterns (PAMPs). The cell intrinsic system involves a primitive system of controlling infection, and studies have indicated that it is the first arm of the immune system to evolve in man. It includes PRRs like the Toll-like receptors (TLRs), NOD-like receptors (NLRs) and RIG 1-like receptors (RLRs). Recognised PAMPs for viruses is often the nucleic acids (RNA or DNA). Three classes of pattern recognition receptors. This unique immune response to virus infection is initiated when PRRs of the host cell recognize PAMPs, which are specific non-self motifs (patterns) within viral products to trigger intracellular signaling events that induce innate immunity, the front line of defence against microbial infection. The actions of the PRRs ultimately control cell-mediated defences and modulate the adaptive immune response to virus infection. 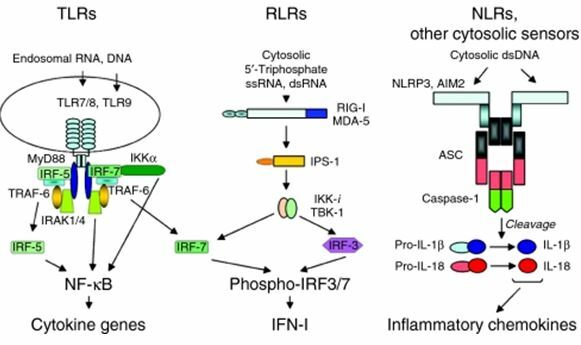 Retinoic acid-inducible gene I (RIG-I) like receptors (RLRs) are a family of cellular sensors of RNA virus infection, and they aid the induction of interferon production, inflammasome activation, and the expression of pro-inflammatory cytokines. The family members include Retinoic acid-inducible gene I (RIG-I), Melanoma differentiation-associated gene 5 (MDA-5) and Laboratory of genetics and physiology 2 (LGP-2). Structurally, RIG-1 and MDA-5 are similar, containing an N-terminal caspase activation and recruitment domains (CARDs) followed by a DExD/H box RNA helicase domain which has ATPase activity and a C-terminal repressor domain. Both are involved in recognition of foreign and infectious viruses/nucleic acids which enter the cells. LGP-2 lacks the CARD-CARD domain, and various studies have shown that though it does not play any role in viral/nucleic acids, it actually has a regulatory effect on both RIG-1 and MDA-5.